So you may be wondering, what do MBA students do with their free time on weekends? In between studying for our classes, we can be found participating in many case competitions! 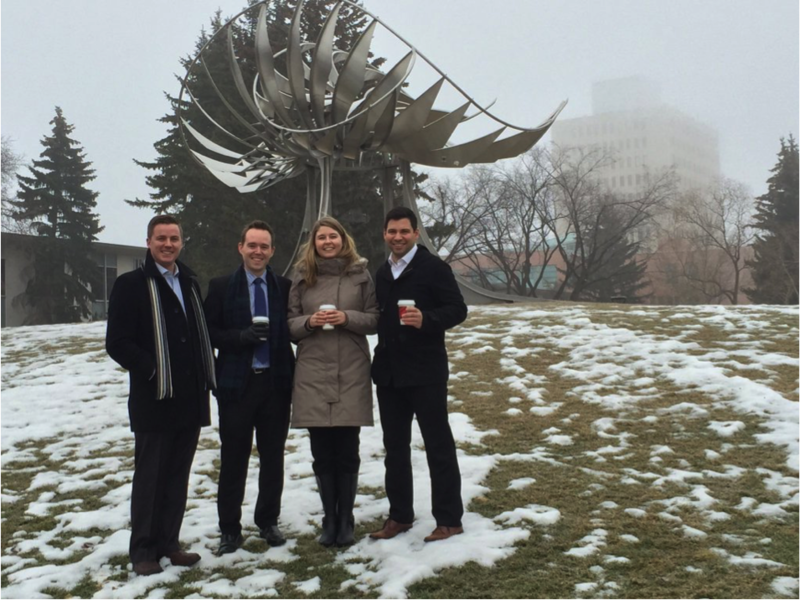 On a cold weekend in February, I travelled with my classmates Spencer Westlake, Rylan Dobson, and Adham Momen to Calgary, AB to compete in the East Meets West Case Competition. 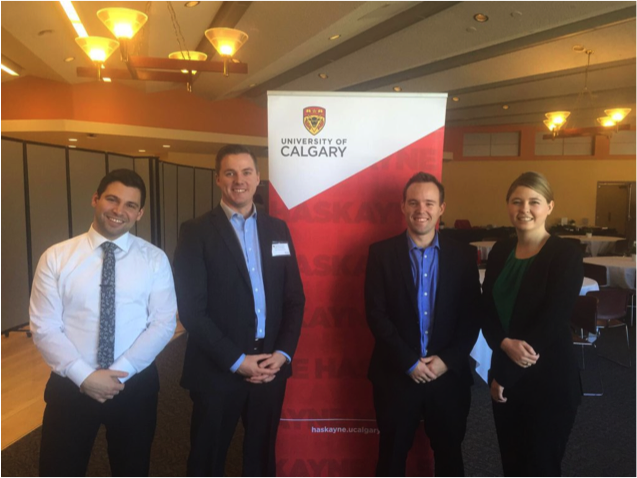 The competition is hosted jointly by the University of Calgary’s Haskayne School of Business, and the Western University’s Ivey School of Business. The competition is designed to foster collaboration and connections between MBA students from coast to coast. Teams from Nova Scotia, Ontario, Manitoba, Alberta, and BC participated in the competition. My teammates and I were excited to compete on behalf of SFU at the competition. Throughout the course of the fall and spring semesters, we had the opportunity through the Segal Case Club to participate in the Acumen Case Challenge, the MBA Games Strategy Case, and the SFU Internal Case Competition. These experiences helped us to hone our skills in case analysis, business strategy, teamwork, as well as presentations and public speaking. Each competition provided the opportunity to improve and learn from the judge’s feedback, and from our competitors. After arriving in Calgary late Thursday evening, we kicked off the first morning with six hours to read the case and prepare our analysis and presentation. The case was focused on community relations issues faced by Altagas, an Alberta based energy company. After securing agreements with BC Hydro and the Provincial and Federal governments, and signing a fifty-year Impact Benefit Agreement with the local First Nations community, Altagas took on a run-of-river hydroelectric project in Northern BC. With the construction phase of the project completed, Altagas needed a strategy to maintain strong community relations throughout the fifty-year duration of the agreement. We were fortunate to have a presentation from an Altagas executive about the specific details and context of the case part way through our six-hour preparation time. After a long day, we presented our analysis and proposed solutions to a panel of three judges. Of the five presentations they saw, they selected two to move on to the finals. Unfortunately, we were not chosen to move on, but we learned a lot through the experience of analysing and presenting our recommendations, and from hearing the judge’s feedback. After the preliminary round, we attended a networking dinner where we met students from across the country, as well as faculty coaches and members of the Calgary business community. It was a great opportunity to share our experiences and hear from fellow students about their programs across the country. We were even able to share travel advice for our upcoming school trips! On the last day, we watched the presentations of the four finalist teams. It was a great opportunity for us to see how these teams approached the issues, and observe where our team could improve in the future. In the end, McMaster was crowned the winning team, with 2nd and 3rd place going to University of Victoria and University of Alberta. With that, the weekend was over, and it was time to fly home for class on Monday. Thank you to the organizers of the competition, my fellow competitors, and my SFU teammates for such a memorable experience! Jacqueline Norris is an MBA candidate at Simon Fraser University’s Beedie School of Business. She is currently the Director of Communications for SFU’s Net Impact Chapter, an active member of the Graduate Business Women’s Council, and a Beedie Student Ambassador. Jacqueline holds an undergraduate degree in Economics, and has experience in retail banking in both sales and managerial roles. She is passionate about marketing, business strategy, and leveraging business to create stronger, healthier communities. Contact Jacqueline on LinkedIn, through email, or on Twitter.